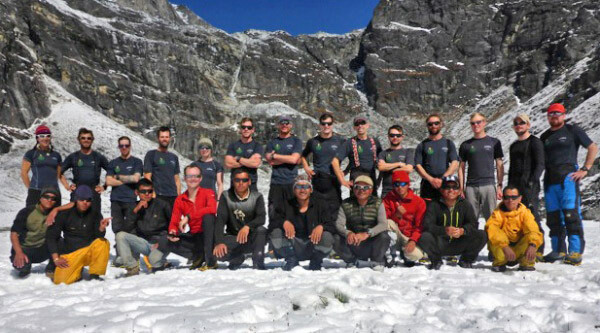 Exercise Parbat Tiger was an Army Mountaineering Association (AMA) expedition to the Kumba region of the Himalayas in Nepal, to climb technical 6000m mountains. The expedition’s primary objective was the development of AMA members to facilitate them leading future high altitude expeditions. Fifteen team members from across the regular and reserve Army, were selected and trained over several weekends and during intensive mission specific training in the European Alps. The team are indebted to the sponsors and benefactors; particularly the Ulysses Trust for providing considerable assistance. After a four day wait for a weather window the team flew into Lukla from Kathmandu, and continued on foot with Sherpa, Yak, and Dzu support to carry equipment. Progressing steadily to aid acclimatisation, the team reached the village of Gokyo (4790m) in seven days having gained 2000m, and then climbed Gokyo Ri (5360m), attaining spectacular views of Everest and Cho Oyi. After setting up basecamp at the foot of Abi, elements of the team conducted crevasse rescue, rope skills, and ice climbing refresher training. Simultaneously two teams led the nose of the glacier, fixing ropes for those following. 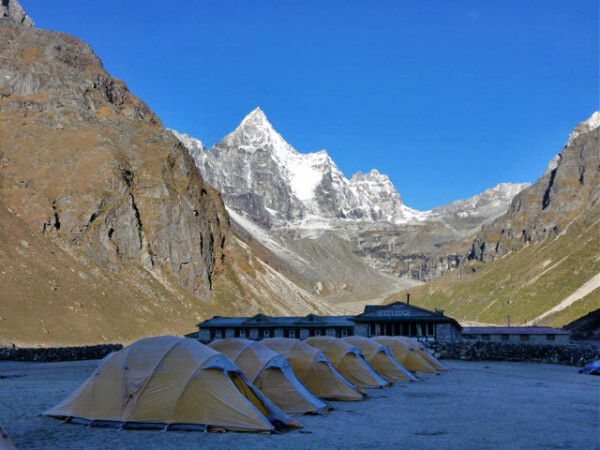 After two days two teams were camping on the col at 5600m, on the third day all five teams attempted the eastern peak of Cholo (6089m). Three teams started at 03:00 from base camp, climbing the fixed ropes in darkness. 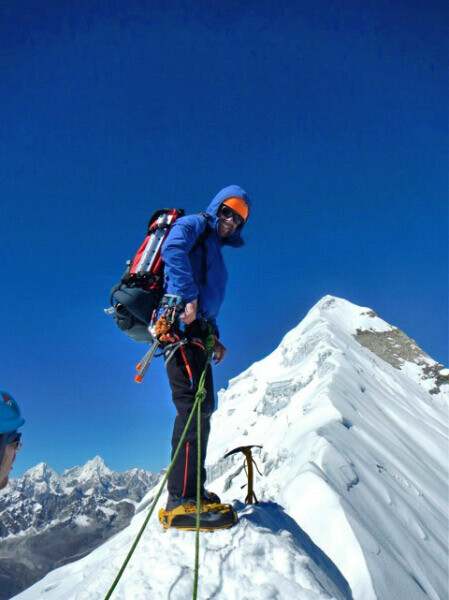 Four of the five teams reached the eastern highpoint at 6050m, unfortunately the objective danger of the final summit ridge was too high to reach the main summit. Still pleased with progress the teams retreated to basecamp, stripping the fixed rope as they went. Being fully acclimatized; Gokyo was made in a day but the weather closed in and heavy snow settled. The following day involved crossing the Renjo Pass with Sherpa guides leading through deep snow, over the pass, and down the long descent into Lumde. Kyajo Ri base camp (5000m) was in a steep sided valley with an imposing headwall, the sun disappeared by early afternoon and the temperature fell below minus seventeen at night. The imposing head wall at the end of the valley gave access to the upper valleys and the Kyajo Ri glacier. With two Sherpa available, two teams could get uplift help each day. Three teams set off up the valley, two with Sherpa help and my team carrying a half load to return that night. Two hours to the top of the headwall, followed by a long valley walk, and another climb into Camp 1. With deteriorating weather two teams set up Camp 1 in a blizzard, my team dropped supplies just below the final climb into Camp 1. The following day the remaining two teams headed up the head wall with Sherpa support, except my team who carried the second half of our equipment. We reached Camp 1, drained and looking forward to a deserved rest day whilst the first two teams attempted the summit. At 03:30 the two teams set off in darkness across the glacier and up another steep 500m climb onto the col; here the technical climbing began. Roped up the teams tackled the first rock band then began the ascent on steep snow slopes towards the summit. The first team disappeared into the cloud and summited before returning to Camp 1 late that evening. 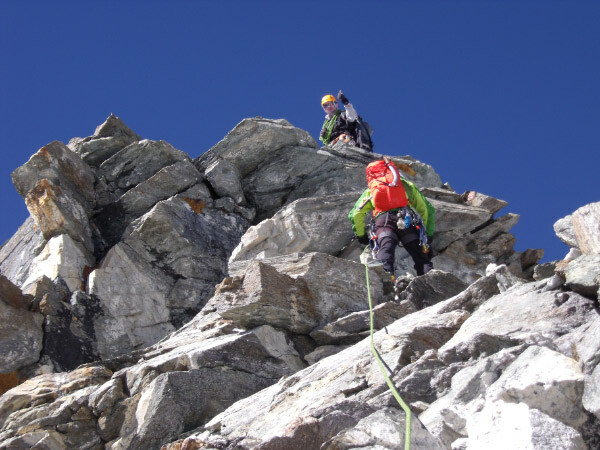 The second team turned around before the summit, showing discipline sticking to the safety turnaround time to avoid benightment. The remaining teams set up a Camp 2 on the col reducing the length of the summit day. Our team carried the equipment up and remaining teams utilised the equipment on successive days. Spare food was taken off the descending teams and our team began the slog across the glacier and up to the col. 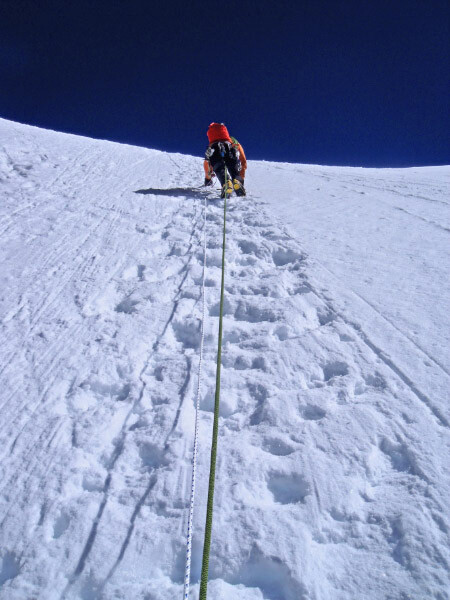 The altitude and weight of the packs made the climb incredibly fatiguing; oxygen levels were half that at sea level. Our team attempted the summit the following day, due to snow fall the previous night leading to an unconsolidated snowpack the conditions at the summit were not safe. Reaching 6100m, only 80m from the summit, we were forced to descend, meeting the final two teams at the col as they took over the tents. The final two teams both successfully summited the following day. We safely returned to base camp for a night’s rest before starting the long descent to Lukla airport, we were on flights to Kathmandu with enough time for a few deserved days of sightseeing and present buying before returning to UK.